A Memorial cross was originally erected by the Army in 1942 in memory of those who perished after the crash of the Dakota which was bombed by the Japanese in 1942. The cross was replaced by a new monument in the 1990s and reconstructed in 2013. Since the monument was severely affected by erosion, the ‘Restoration Committee Dutch Monument Carnot Bay’, led by Mr Dion Marinis and executed by the Australian Defence Force, decided to re-erect the monument, with financial support from the Shire of Broome, the Department of Indigenous Affairs and the Netherlands Embassy. The new monument erected in 2013 not only commemorates those killed but also commemorates the role played by Aboriginal people in rescuing survivors. On 3 March 1942, Dutch Dakota DC-3 PK-AFV of the KNILM (Netherlands East Indies KLM) piloted by Captain Ivan Smirnoff, left Bandung in Java headed for Australia with a plane load of evacuees and a box of diamonds worth approximately £300,000. They managed to escape Java just 3 days before the Japanese took the Bandung area. They were attacked by three Japanese Zeros about 80 kilometres north of Broome. Captain Smirnoff was wounded several times in his arms and hip. Smirnoff managed to put the Dakota into a steep spiral dive with the Zeros in pursuit and made a forced landing on the beach. In the four days that Smirnoff and his sick and dying passengers spent on the remote Kimberley beach, desperately searching for water and help, there was at least one attempt to retrieve the box from the damaged aircraft, but it washed out of the hands of one of Smirnoff's crew when a wave unexpectedly hit the Pelikaan. Four of the group died as they waited to be rescued, including an 18-month-old toddler, and were buried in the wet sandflats. After again being attacked by a passing Japanese bomber that had picked up their position via a faint SOS call from the group's ramshackle radio, they were finally rescued by German Catholic missionaries from Beagle Bay, 60 kilometres or so north. Three men who knew about the downed aircraft were arrested and in May 1943 they appeared in the Supreme Court in Perth charged with stealing the diamonds . Smirnoff's evidence was expected to be crucial, but the dashing airman told prosecutors he could not remember what had happened to them. All three were eventually acquitted and only a small amount of the diamonds were ever recovered. 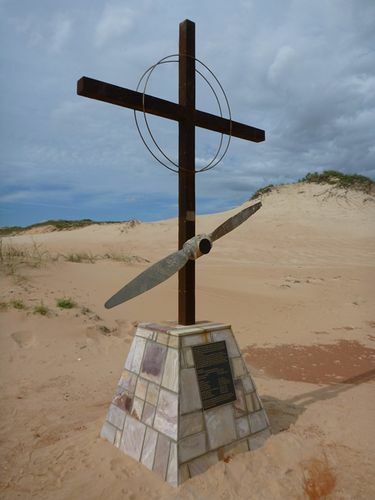 This monument marks the location which is now known as Smirnoff Beach, where on the 3rd of March 1942 the Dutch aircraft DC-3 PK-AFV dubbed the "Diamond Dakota" force landed after being attacked and strafed by three Japanese Navy A6M.2 Zeros returning from an air raid on Broome. Captain Ivan Smirnoff who was wounded in both arms and hip valiantly took evasive action to land the DC-3 on this stretch of beach. Four people died and a number were wounded in the attack. A rescue party from Beagle Bay assisted survivors to safety. The rescue party consisting of Mission staff and Aboriginal people was led by Warrant Officer Class 2 Frederick "Gus "Clinch of the Australian Army. Without the courage displayed by W/O Gus Clinch, Joe Bernard, Brother Richard Bessenfelder S.A.C. and members of the Beagle Bay community, the survivors whould surely have perished in this unforgiving environment.